People are working 24/7 for the school to be ready. It is 7:00 p.m. I left school at 4:30. Tim and I swam laps at the pool of the club we recently joined, came back to our apartment, and had a beer. I look out our window. I can see the American School of Bombay. 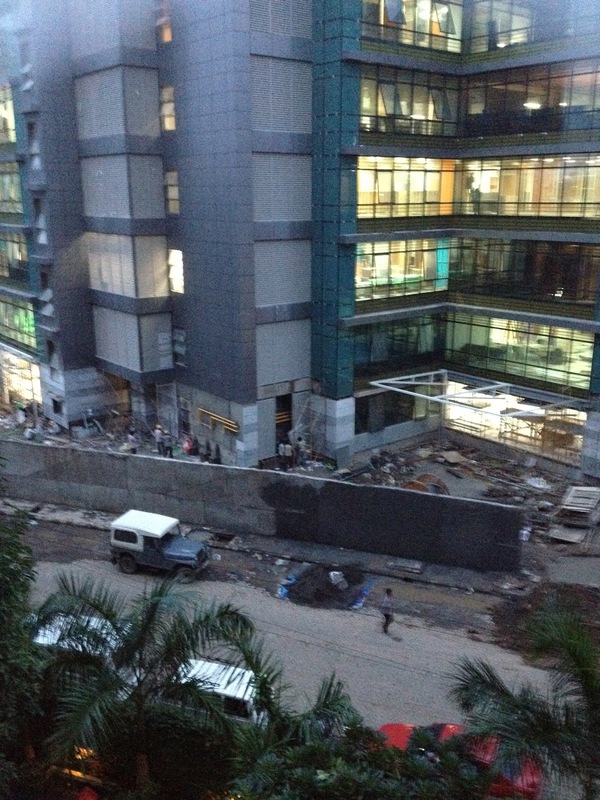 Just like at 8:00 this morning, men are working furiously to finish the school in time for the first day. Men carry bricks on their heads, men lay bricks in the monsoon soaked mud, men flatten walls to make a smooth surface. My mind reviews the day. It is 8:05 a.m. My phone is ringing. It is Kiran. 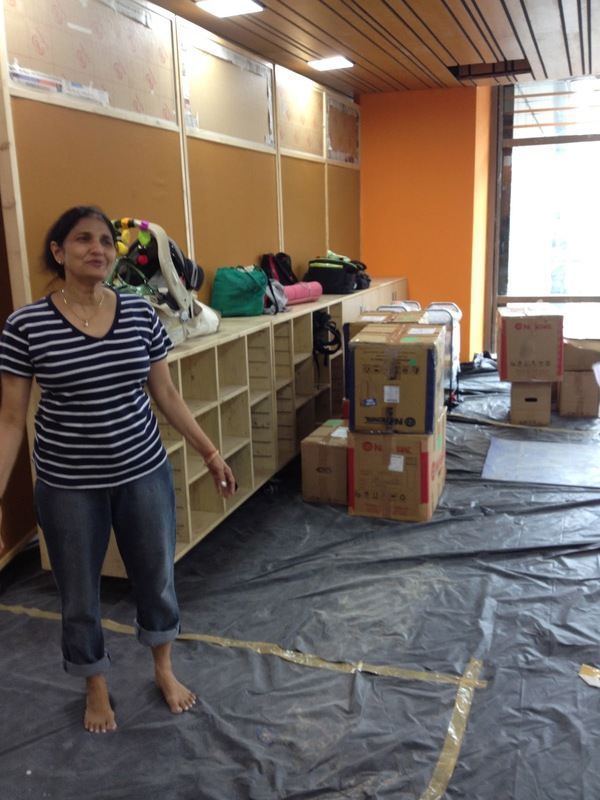 Kiran is an Indian woman who has taught in three countries. She has a dignified way of holding herself and long black hair held back by a clip. She is a teaching assistant. Kiran noticed I am not at the first meeting of the day and is concerned about me. I am on the fourth floor of our building where the schedule says we will meet. Kiran and the rest of the staff is on the second floor where the meeting is taking place. Kiran is a woman in charge! I go to my classroom. It is consumed by boxes packed by the previous third grade teacher. The cabinets in the room are dusty and dirty. Kiran and Gemma (another assistant) immediately begin to wash the cupboards of all the third grade teachers. At about 10:00 Gemma excuses herself to attend a funeral of the husband of a fellow worker. The husband was only 40 years old and leaves a wife and a one year old child. 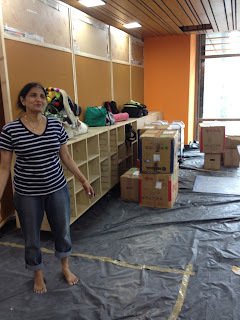 Kiran and I begin to tackle the Herculean task of setting up my new classroom. Kiran is an organizer who speaks Hindi. Kiran directs a man working on our floor to begin breaking down boxes, others to bring chairs and then desks to the open area between our classes, another man is told to cut open the many boxes in my room. A man is standing on counters cleaning the insides of the windows. Another man is whisking away at the area behind the counters with an Indian broom. For a few hours I am left with this army of workers while I sort out the unknown contents of my boxes. Remnants of another class, another teacher, another building—now the beginnings of a new class, a new teacher, a new building. Kiran pops her head into my class. It is time for lunch. “Come eat lunch with us,” she invites. We head down to lunch, load up our plates with rice, paneer, and chicken. We sit with a kindergarten teacher and her partner. Gemma joins us. She looks tired. We wait as Gemma finishes her lunch and trudge up the stairs to the third grade. Gemma is a gracious, hard worker. Kiran heads over to help another third grade teacher. Gemma stays with me. Gemma is a wise woman with years of experience and organizational skills. She wears her silver grey hair clipped short and has a small, athletic frame. She hears my plan for the cupboards and starts to work. As we unpack boxes, we realize that many items are grimy and need washing. Gemma sees men who seem to be interested in helping. 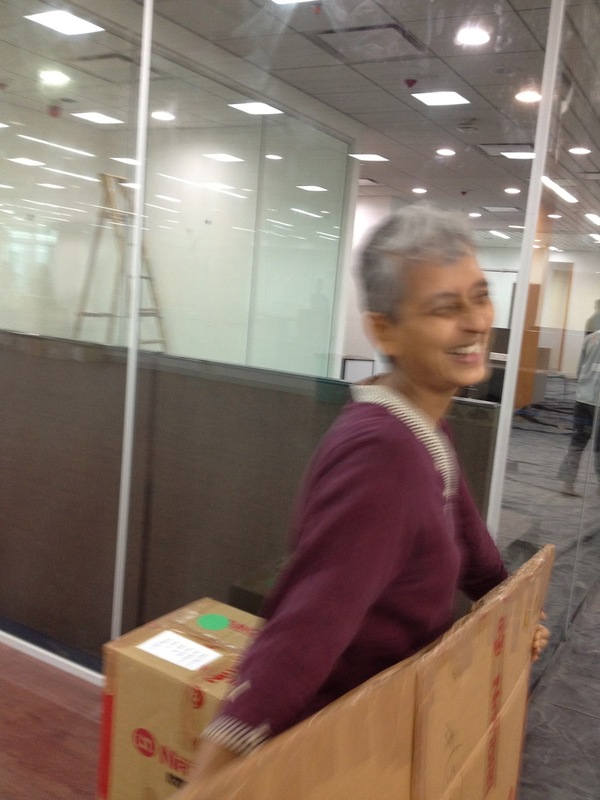 In Hindi, she sets one man washing clipboards. He squats by our bucket of soapy water and begins carefully to scrub the clipboards. Gemma shows another man how to check the calculators to see if they work. She speaks with patience and kindness. I turn from my task and see another man sitting, one leg folded in front of him, another leg bent in an upside down V. He is sorting geometric shapes. All of these men are shoeless. They have been instructed to leave their shoes near the stairs of our third floor. They are wearing clothes that are paint, plaster, or mud spattered. They have a childlike wonder in this land of bright colored educational materials. I can tell these men have never seen anything like the items we are storing away in cupboards to use at another time. 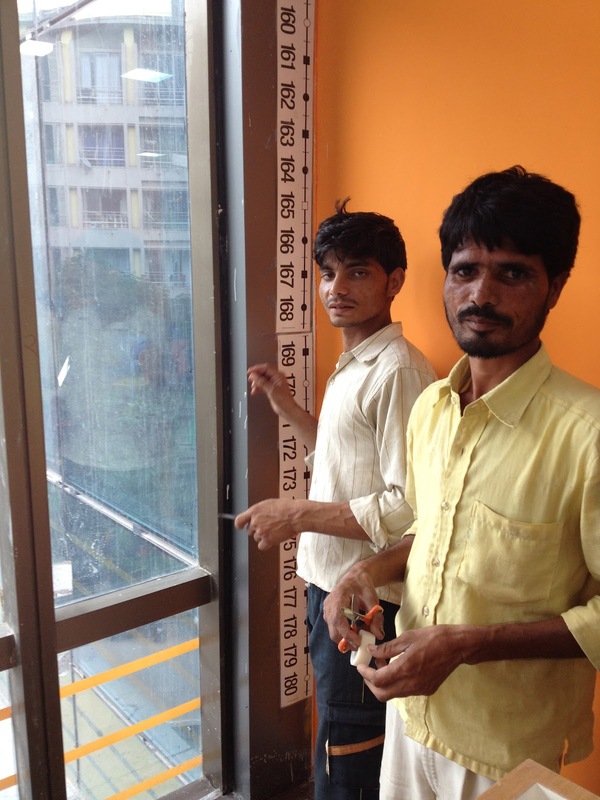 I say “shoe-kree-ah”— thank you in Hindi, but either my Hindi is unrecognizable or these men speak Marathi. Only my folded hands and smile seems to connect. Two of the men recruited to help us in my class. It is 3:00. Gemma looks tired. I ask if she is ready to go home. Gemma tells me the bus leaves at 4:00. She says, let’s keep working. I say that funerals are exhausting. Gemma tells me her sister passed away last year. We talk about how our sisters were (are) our best friends. We have connected. We both recognize loss, the beauty of sisterhood, and a budding friendship.